← Good Guy with a Gun? The AR-15, allegedly the most popular consumer rifle in the United States, has become the poster child of the gun control industry. But from a homicide statistics standpoint, they are mostly harmless. AR-15s constitute maybe 4% of all American firearms. 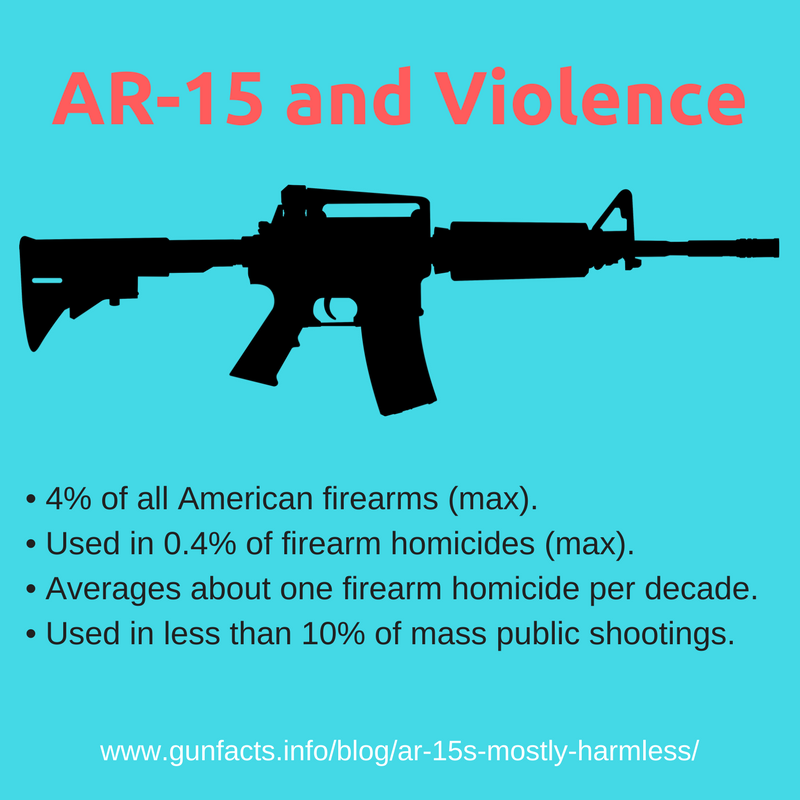 AR-15s are used in 0.4% of firearm homicides, maximum. Just How Many AR-15s Are We Talking About? There is no doubt the AR-15 is a popular rifle. The firearm industry notes this. Users note this. Even the gun control industry notes this. Knowing how many are out there is crucial for understanding if they are a problem or not. 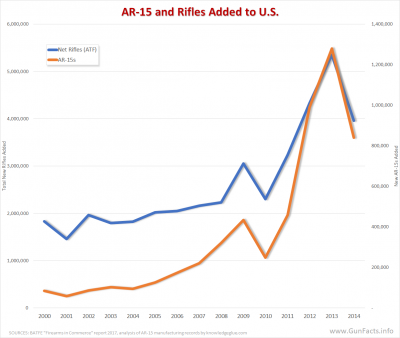 The AR-15 has been around since 1959, but the last eight years has seen a significant increase in its popularity. And no wonder. The rifle is lightweight, meaning anyone can shoot it (YouTube has a bunch of videos of tiny young girls firing them). They don’t recoil much due to the mechanical design as well as the relatively anemic rounds they shoot. And, well, they are fun. FULL DISCLOSURE: I have never owned, not do I want to own an AR-15. Just not my thing. Given that AR-15s have been around for nearly 60 years, knowing just how many are in circulation requires guesswork. According to one compilation of manufacturer records 1 over five million have been made since the year 2000. The NRA once estimated 2 there were about 15 million in circulation as of the end of 2017. Triangulation we did from BATFE reporting 3 makes us believe that total is a reasonable one. … they become even less of a problem. Let’s start with mass public shootings (MPSs) like the recent tragedy in Parkland, Florida. Because AR-15s were used in both the Sandy Hook and Parkland school shootings, they appear to have an outsized role in MPSs. But, the numbers betray this a bit. Of the MPSs since 1982, at worst AR-15s were used in a mere 11% of those events. But one of those MPSs was a terrorist attack (San Bernardino), so the effective policy number is that 9% of MPSs involved AR-15s. But even this is overstating the case. In most MPSs, the attacker carries in more than a few guns (and the enduring fact is, most MPSs are committed with handguns and shotguns). So, if we discount AR-15 involvement due to someone shooting up a room using his handguns, shotguns and AR-15, then the effective number of AR-15-specific MPSs drops to 6% of the total. Mighty slim pickings for MPSs. But, the case against AR-15s gets even weaker when one looks at all homicides, not just MPSs. Common estimates for the number of guns in circulation 4 is between 270 million and 357 million. For our analysis we’ll use the high end because until the mid-1970s, nobody was really tracking this stuff. The stockpile of farm weapons, hunting rifles, war trophies, and so on is likely much larger than most prognosticators allow for. Combining this estimate with the percentage of new guns entering the national stockpile every year 6 we see that AR-15s make up at most 4% of all the guns in the United States. 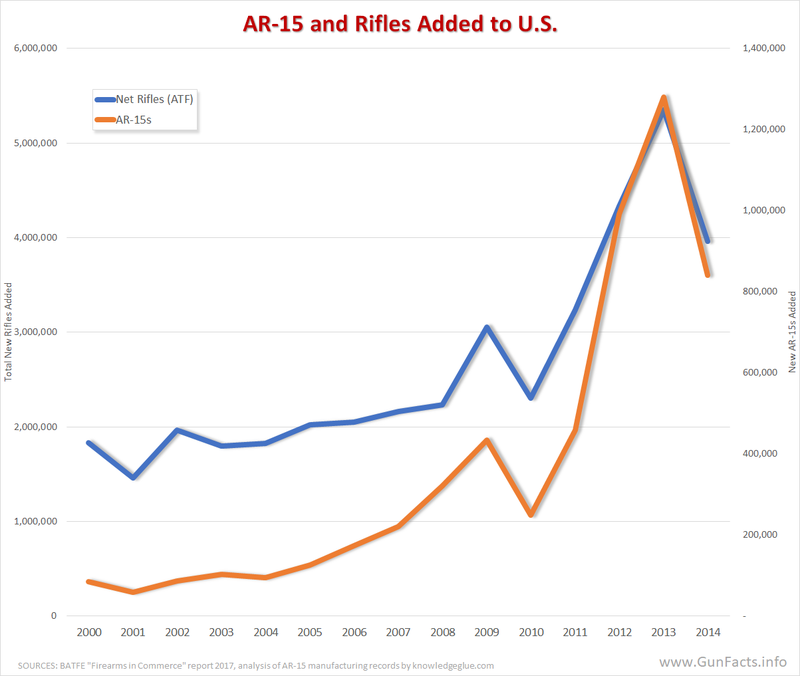 This number is way high given that the AR-15 was not introduced until 1959 and did not enjoy a massive market uptick until 2012–2017. But, we’ll stick with the very high 4% number as it makes the final figures that much more interesting (in other words, we are stacking the deck against the AR-15). Rifles are not the homicide weapon of choice. Handguns are. Sixty-eight percent of firearm homicides are committed with handguns 7; and most of those are inner-city, gang related shootings. Rifles are used in 3% of homicides (soak that up for a moment – handguns 68%, all rifles 3%). Since we can estimate what fraction of the number of rifles in circulation are AR-15s, we can then calculate how often they are used in homicides. All in all, AR-15s account for 0.4% of firearm homicides at worst. NOTE: The FBI data used was from their most recently available dump, covering years 2012-2016. This, the number of rifle homicides includes the Sandy Hook Massacre where all the school victims were killed with an AR-15. It has been claimed that members of the gun control industry don’t care about facts, just imagery. Their fixation on AR-15s is a case in point. One type of firearm, which accounts for 0.4% of firearm homicides, is their poster child, their scary image for the nightly news. If they really wanted to ban something to make America safer, they should start with their own rhetoric. it was presented as fact by our own government. Knives kill a bunch too. The AR-15 was not my choice for a very long time, but as mentioned, a fun gun to shoot. Initially, I preferred the WWII rifles, but the “fun” part diminished as I got older. Another thing which the anti-Second Amendment crowd doesn’t know, is that it was advertised as a rifle for hunting varmints and other small game. It was later that the military saw some value in the gun using a smaller, inexpensive round, and made necessary modifications (illegal for civilian acquisition). At close range, a .22 can kill just as easily as a .223 or 5.56. A 30-30 is at the low end of deer rifles and has much more “killing” power than an AR-15. A 30-06 will take down any animal in North America with the possible exception of the Kodiak Bear and that depends on the weight and type of bullet and where the bear is hit. The AR-15 “style” is available in .22 Rimfire as is the Ruger 10/22 and other .22 semi-automatic rifles. All you anti-gun freaks out there can thank the media and Hollywood for popularizing the AR-15 style rifle. With the exception of pistols, virtually every “shoot-em up” movie you see features the AR-15 style weapon. It’s popular because it looks macho, and the military uses a vary different version of it, although far far more lethal. If you watch any interview on TV of the average citizen, they can’t tell what an assault weapon is. Hmmmm….why is that? It’s because it’s a fabricated term by the corrupt media, and the ignorant anti-gun crowd has simply picked up on it because the term “assault” sounds mean and menacing. Law enforcement and the military wouldn’t use an AR-15. Just because a weapon has similar visual characteristics doesn’t mean it’s the same rifle. To the anti-gun, anti-NRA, and anti-Second Amendment crowd, they’re ignorant of facts, but heavy on meaningless rhetoric. A 30-30 is NOT on the low end of deer rifles. Many out west use a .243 or .270, both of which are smaller than the 30-30. The .243 and .270 are both smaller diameter projectiles than the 30-30. That is true. However, the 30-30 has lower muzzle energy than either if those cartridges because of its lower initial muzzle velocity. 30-30 IS on the low end of deer rifle cartridges. Get out your dictionary. “mostly harmless” vastly OVERSTATES the 0.4% is mot “MOSTLY”. “Mostly” is a weal adjective. It is infinitesimal. How about “is misused (by as HUMAN) in few instance” or something else. Well, I was working a play-on-words, namely my hijacking the title of a famous sci-fi book. In that book, the perceived threat of the Planet Earth was rated as “mostly harmless”. They don’t recoil much due to the mechanical design as well as the relatively anemic rounds they shoot. AR-15. 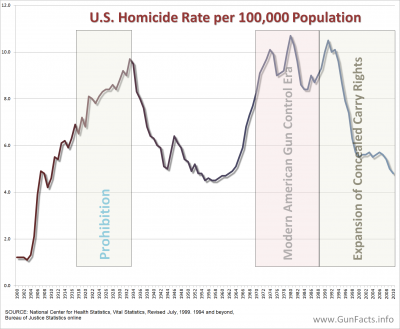 One firearm homicide per decade? There were 17 recently in Florida…?? As noted in the article, that is the average over multiple years. So just the 17 in Florida take care of the average for the last 170 years if my math hasn’t completely deserted me. That is longer than the entire existence of the AR-15. I think someone forgot to move a decimal point in this 1 per decade calculation. I’d like to be proven wrong but doubt that will happen in this instance. Your comments are well taken, and points to my being in too much of a hurry in my writing. I could have explained things more precisely. There are two ways of looking at the stats: one is the known usage rate, the other is the extrapolation from FBI stats on rifle homicides. Both are valid to a degree. Using the number of rifle homicides per year, the percent of rifles that are AR-15s, we can see that on the low end, we have very few AR-15s homicides. On the high end, like with your calculations, we see a larger number, but one still small in terms of both total homicides and firearm homicides. What would be helpful, though I know of no complete or accurate data source, is a list of homicides by make/model of firearm. In the absence of that, we have to estimate the ranges. One helpful question to ask is if we include unusual events, such as Parkland. These events are statistically rare, have definitive mental health causations, and even the use of rifles (much less AR-15s) are the minority case, so I’m included to look at the numbers in general first, then look at mass public shootings as a separate field of study.